The goal of any property investment is to increase the value. You want it to be worth more than when you bought it. There are low-cost ways to add value, and there are more expensive and in-depth renovations that can be done. There are simple things any property owner can do which can boost the appeal of your property. While these simple tips may not add tens of thousands of dollars to your property’s value, without doing them, you may not be able to realize the full potential value of your property. These fixes can be done without having to hire any outside help. Although they are low cost, they can make a huge difference in the way your property looks. Clean: Making sure your property is clean will have an immediate return on the value of your property. This includes both the outside and the inside. Garbage, dirt, and strange odors are not attractive features. Paint: You will be amazed by the difference a fresh coat of paint can make. It can revive and brighten a tired space. Neutral colors are universally appealing. Add Curb Appeal: A few strategically placed plants, a new mailbox, outdoor lights or shutters can make your property more inviting. Higher cost and potentially higher return projects include new siding, new walkways or driveways, and adding a deck. Change Fixtures: Change out a doorknob, light switch cover, cabinet handle or even a light fixture. It's a simple method to breathe new life into a space. Stage the Property: De-cluttering a space and giving each room a function can add value because many buyers lack imagination. Proper placement of furniture, the size of furniture, and the amount of furniture are also crucial. Add architectural detail. You can give a boring room some character by adding a chair or crown molding to it. Change or add windows or doors. This is a valuable addition. Not only does it improve the aesthetics of the home, but it also can reduce noise inside the home, help lower heating bills and cooling bills and increase natural light inside the home. French doors that lead out to the backyard add elegance, open up space, and allow more light to enter the property. Skylights can also help brighten up spaces that may be lacking windows or natural light. Properly positioning windows and doors can also help highlight a beautiful view that your property may have or minimize one that is not so desirable, such as a brick wall or a view right into your neighbor’s home. Change flooring. Updating carpet or adding hardwood or tile adds value to a property. Reduce noise. People want to feel like their home is an oasis. There are many ways to reduce noise such as adding insulation, installing double pane windows and doors, installing carpets and rugs to minimize footsteps and placing plants to absorb noise further. Update a kitchen or bath. This includes changing a portion of the room, but not an entire gut renovation. It could be changing the flooring or changing countertops. In the bathroom, you could switch out a toilet, sink or bathtub. In a kitchen, it could include buying new appliances. Gut renovate a kitchen or bath. This would be a complete overhaul of the room. It can involve adding new cabinets, new countertops, new flooring, new lighting fixtures, new appliances, new sinks, new faucets, new cabinet handles, new tub, new shower, a new toilet or even changing the layout of the room. Update siding. There are many options for home siding, and the best type will often depend on the climate and area where your property is located. It is an update that will improve the aesthetic look of your property and can help lower your utility bills. Create a more functional floor plan. For example, this could be taking down a wall between a kitchen and living room. It could be rearranging a kitchen to create more usable space. It could be adding a bathroom to the master bedroom to create a suite. It could also be swapping the location of two rooms, such as an office and a dining room to create a better flow in the home. It could also be taking space away from one room to add it to another room, for example, taking some space from an oversized living room to create a pantry for the kitchen. Add more square footage. This does not only mean adding an addition to the property. It could also mean finishing an unfinished attic or a basement to add more living space to the property. It could also mean transforming an attached garage into additional living space. Gut renovate a property. Completely redoing a property by ripping it down to its studs and building it back up with a more modern design and materials can increase the value of a property, as long as you can sell the property for more than you owe on the property along with renovation and holding costs. While you want to improve your property and increase the value, you also want to be cautious so that you do not over-improve your property. You don’t want to spend an amount of money on a renovation where you will not see a return on your investment. For example, putting high-end Viking appliances in a home in a middle-class neighborhood would be an over-improvement. 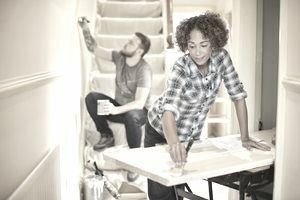 Before you renovate, do some research on your area to find out how much the property will be worth after the renovations, also known as the After-Repair-Value or ARV. Once you accurately gauge this new value, you can deduct the price you paid for the home and what you are left with is the maximum price you should spend for the renovation and any soft costs such as financing charges, closing costs, and holding costs if the property will sit vacant while the renovations occur. What Type of Flooring Is Best in a Rental?